Innovative with narrative and voice, the novel chronicles the life of Walt Whitman Woodcock, a Southwest Texas ranch boy who comes to Columbia, SC with a seven-point plan for achieving true bliss. Armed with a phonographic memory—everything he hears, he remembers—a job waiting tables at the Dixie Fish, and a fraudulent admission to graduate school, W.W.W. sets about the task of creating nirvana in the capital of South Carolina . . . 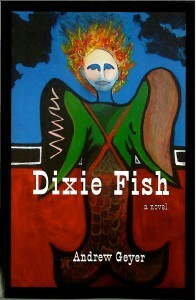 Published in 2011 by Ink Brush Press, Dixie Fish is Andrew Geyer's second novel. Nineteen years in the making, the book blends Greek philosophy, classic country, cool jazz, and the American democratic experiment to tell a heartrending tale of love and betrayal, self-sacrifice and greed, true bliss and dark violence. Cover art by Austin, Texas artist Eric Beverly. For the philosophers who happen upon the back of this book, my advice is buy it, turn it over, and look clear through into its bones for a remarkable commentary on Aristotle's discussion of philia in the Nicomachean Ethics that will take you right on through (as Aristotle would) to tragedy. For everyone else, I say Andrew Geyer, with pitch-perfect phonographic memory, has described a Christ-haunted rainbow of bliss from one edge of the South to the other with just the right dashes of Jefferson, King, Hank Williams, Tammy Wynette, Mozart, Beethoven, Thoreau, and the Apocalypse to do Walt Whitman—solitary, singing in the West—proud. If you don't hear America singing in Dixie Fish, I doubt even the Southwest Texas sun would make you see the light. But trust me on this: read it, and you will—and you'll get one hell of a ride in the process. Dixie Fish is a tale of bliss gone awry. Walt Whitman Woodcock's part-time job in a fried fish restaurant devolves into a personal descent into hell--one brimming with deceit, betrayal, and a host of unrepentant sinners. Dixie Fish is a journey that takes us from Southwest Texas to Columbia, SC, and at least part way back. The trip is by turns rollicking, heart-wrenching, and terrifying. It's the sort of character-driven roller coaster that can change the way folks look at things--like the world they live in and how they might survive.